The food at VC is OK. 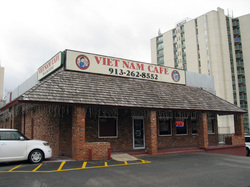 I don't know how authentic is it or not, but to me it is not as appealing as other Vietnamese restaurants in the city. Why? The atmosphere is simply horrible. 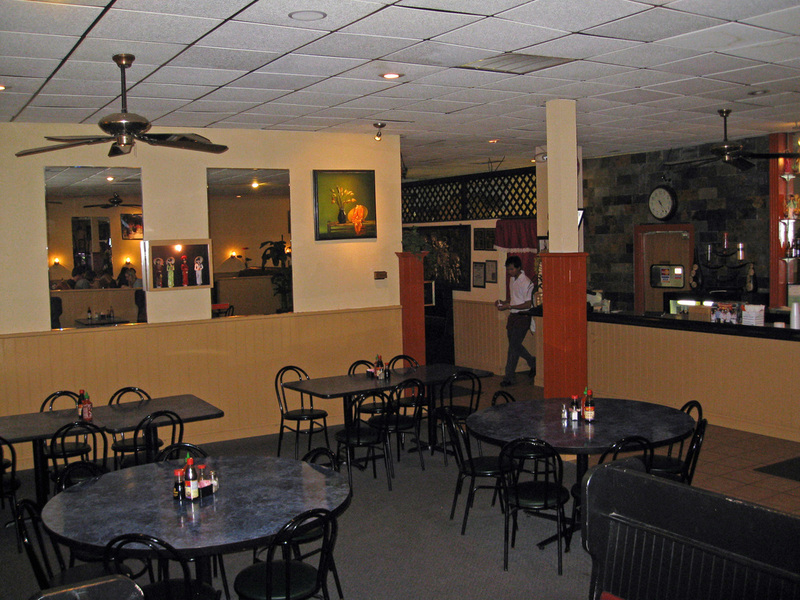 Take the same space, open up the windows, put the seating in front, and paint the walls a fun, vibrant color, and you have yourself a restaurant. But, as it is, I am almost suicidal every time I go there. Food tastes so much better when you are in an environment conducive to eating. 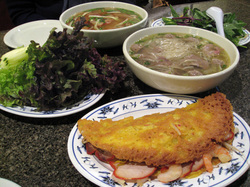 Try the crispy pancake (don't forgo the sauce), Vietnamese coffee, and Vietnamese spring rolls. To put it frankly, Vietnamese Cafe' is not very visually appealing. On the outside, it looks like a big, boring, and slightly rundown chain restaurant and, unfortunately, the inside is not much better. Very dingy and dark, the restaurant seating is way in the back room which has no windows. Grey industrial carpeting, acoustic ceiling tiles, boring beige walls, and red leather booths do nothing to give this place charm or atmosphere. A small attempt at decorating means a slate wall behind the bar, televisions playing in every corner, and mirrors along one side, but even when busy the restaurant give off a depressing, unflattering, and stagnant air. The fireplace is covered over with Vietnamese icons and soft ethnic music plays in the background but the place is essentially soulless. Service is basic at best, and slow. Sometimes there is a language barrier as well. VC has a large menu with many options to choose from, all reasonably-priced. One of the things they boast about is that they serve 'real pho'. I am not sure, is there such a thing as fake pho? Or, is it faux pho? Haha. The first thing we ordered was a traditional crispy rice pancake, filled with shrimp, pork, and bean sprouts. The pancake, which is huge, seems a little greasy at first and without much flavor but, as soon as we cover it with the spicy sweet sauce it came with, it was delicious. We also had a chicken soup with pork and cellophane noodles. Coming with the soup is the traditional plate of bean sprouts, cilantro, jalepenos, lime, and basil. And, although the broth was very good, the soup was not very hot, nor did it have a lot of meat. We also tried the combination pho, which had pork, meatballs, and noodles. On this one, the 'meatballs' were a little weird for us, reminding us more of organ meat than meatballs. We even had to ask what they were. Again, there was not much meat here either. And, although I do not know what 'real pho' tastes like, the broth was strangely spiced. Was that nutmeg? We both found it a little odd. 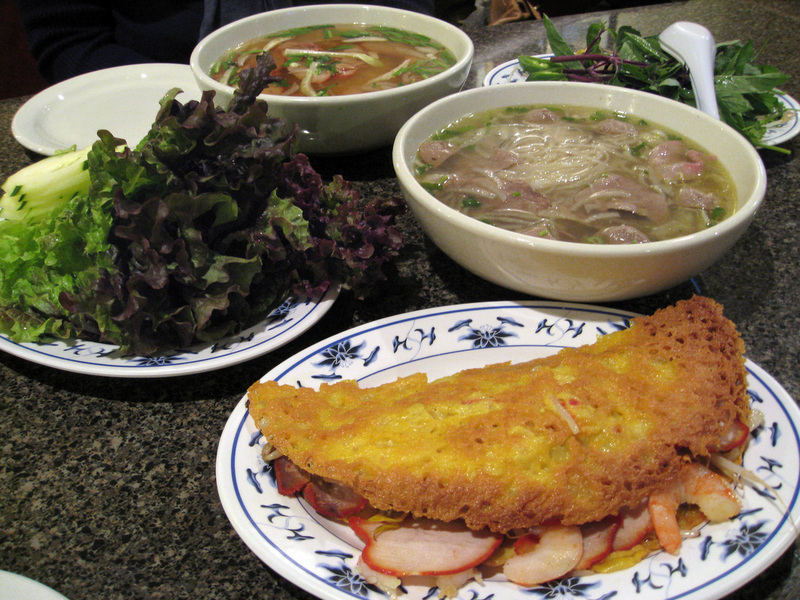 After our trip to Vietnam, I will be able to discern the real taste of pho. Along with the meal, I had a vietnamese coffee, strong coffee brewed over a glass and served with sweetened condensed milk. I love this! But, it does pack a caffeine punch, so be forewarned. I would also like to add that, although we did not have these on this particular visit, VC has very good vietnamese spring rolls that come with a delicious peanut dipping sauce and are very reasonably-priced. The restaurant and bathrooms are basically clean, though I wouldn't eat off the floor, or anything. The portions are large and the prices very reasonable. The soups do not have a lot of meat, nor were they hot enough. The atmosphere is downright depressing and the service slow.